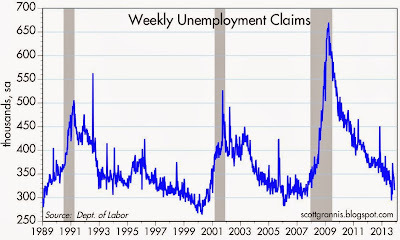 After several weeks of volatile claims reports—stemming from the government shutdown and computer problems in some states, first-time claims for unemployment are back on their declining trend. 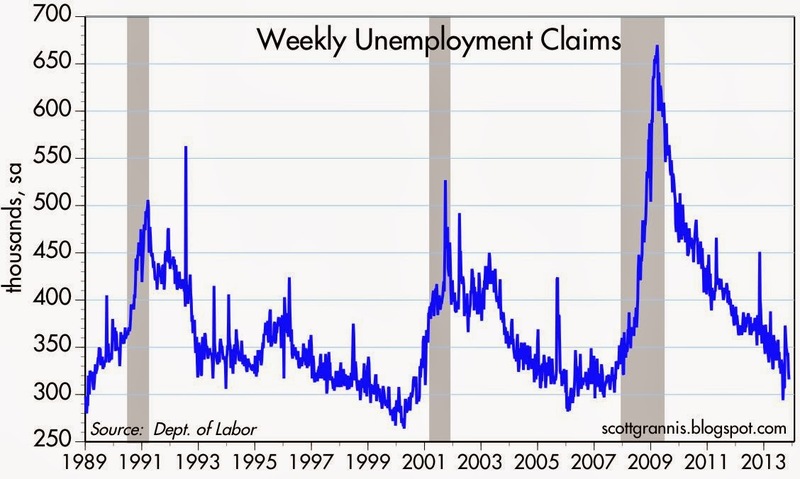 At this rate claims will reach their lowest level in decades within a month or so. 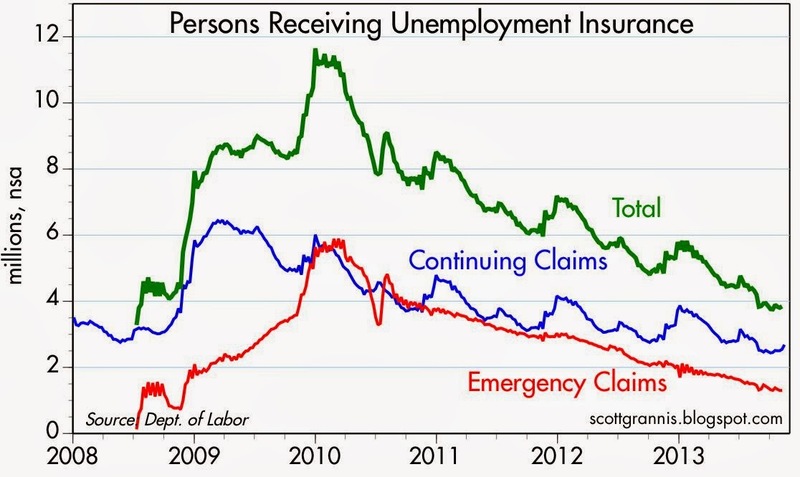 The number of people receiving unemployment compensation also continues to decline, down by an impressive 25% in the past year alone. Combined, these two timely indicators of labor market conditions point to an economy that is registering important improvements on the margin. The U.S. economy has been growing slowly but more or less steadily for the past four years. 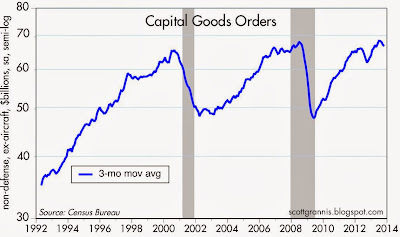 Businesses have tightened their belts and streamlined their operations; as a result, corporate profits are at all-time highs, both nominally and relative to GDP. All that's lacking is an increase in the pace of hiring. 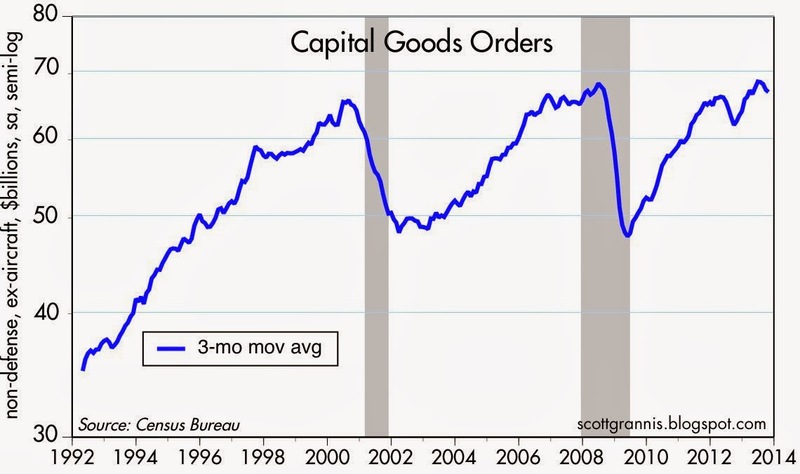 October capital goods orders—a good proxy for business investment—were weaker than expected (-1.2% vs. 0.8%). In fact, they've been weak for the past year, and this dovetails with the modest increases we've seen in hiring activity. What we're left with is an economy that is suffering from a "failure to thrive." It wouldn't take much in the way of better, pro-growth fiscal policies to ignite a stronger economy. It's unfortunate that this is unlikely to happen anytime soon. But it's not a reason to be pessimistic about the future. Sure. 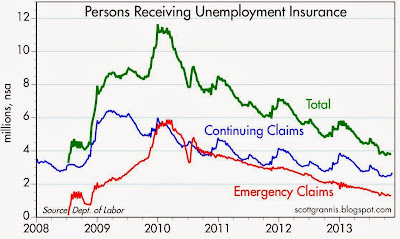 If unemployment insurance emergency claim benefits are eliminated on December 28 as scheduled, 1.3 million households are going to thrive in January 2014. Sure.